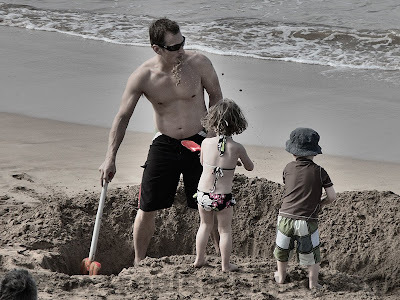 Guys love to bring shovels to the beach to dig holes. I don't get it. Sandcastle building, I can understand. But just a hole? Why? Excavation was immediately halted after this photo was taken. You may notice the shovelful of sand headed toward dad's face - he did not seem to appreciate its arrival. Dude, you're on the beach, it's only sand, and you're the one who brought shovels, lighten up. It's not the end of the world.